At long last, our Hellebore are now in flower. And making quite a scene! These particular ones still under our fig tree at the front of our property but we have more in the back paddock, in the silver birch copse. 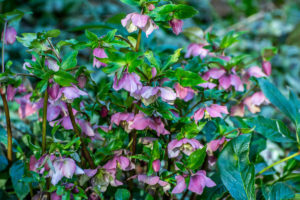 They’re newer plants so smaller, but over time, as the silver birches grow, the hellebore will spread in size and number. They should look spectacular in a few years – at least, we hope so.